The cold weather moved in and I was forced to harvest things as quickly as possible out of our little urban farm’s garden beds. 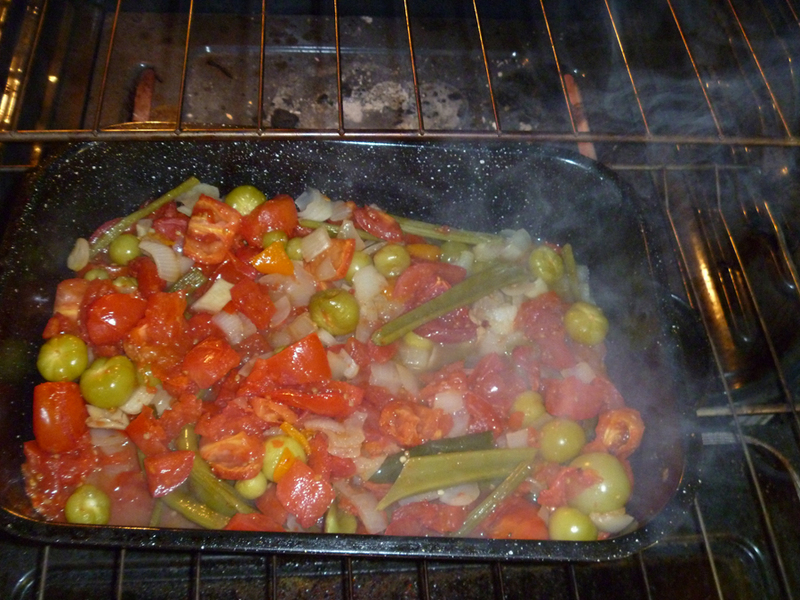 There wasn’t enough of any particular crop to do any solo food preservation — tomatoes, onions, peppers, celery, and the like. The night before the ‘beat the frost’ harvest, we had a roasted pork dinner. My youngest two children love BBQ sauce on many things — chicken, pork, fish (don’t ask), french fries (I bake homemade kind)…So, son is glomping BBQ sauce onto his plate and I take a look at the bottle. Even the “organic” and “natural” brands have all kinds of crud in them. Too much sugar, too many preservatives, caramel coloring, ugh. That’s when the idea to make my own hit me. 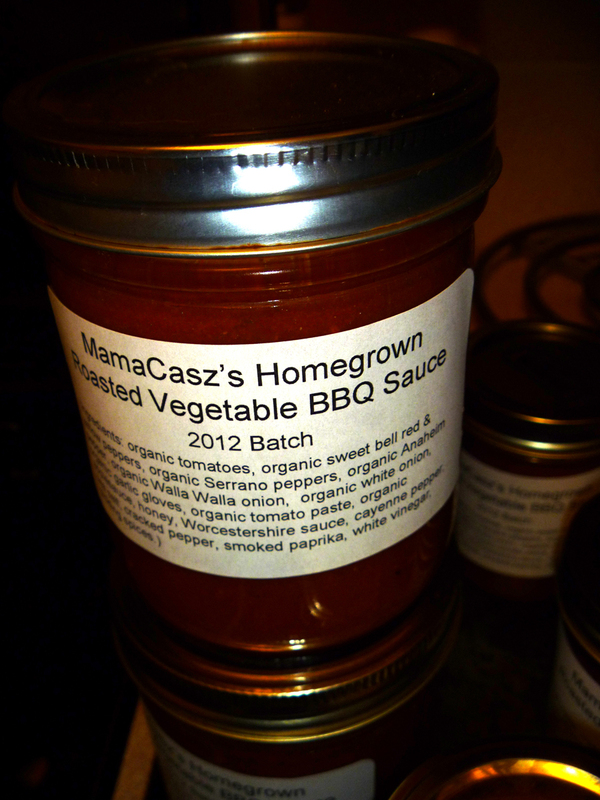 I did a little research, found some old recipes in my canning books, on the internet and then took an inventory of the ingredients I had and ….MamaCasz’s Homegrown Roasted Vegetable BBQ Sauce was born. Heat the oven to 325. Spray the roasting pan with cooking spray. 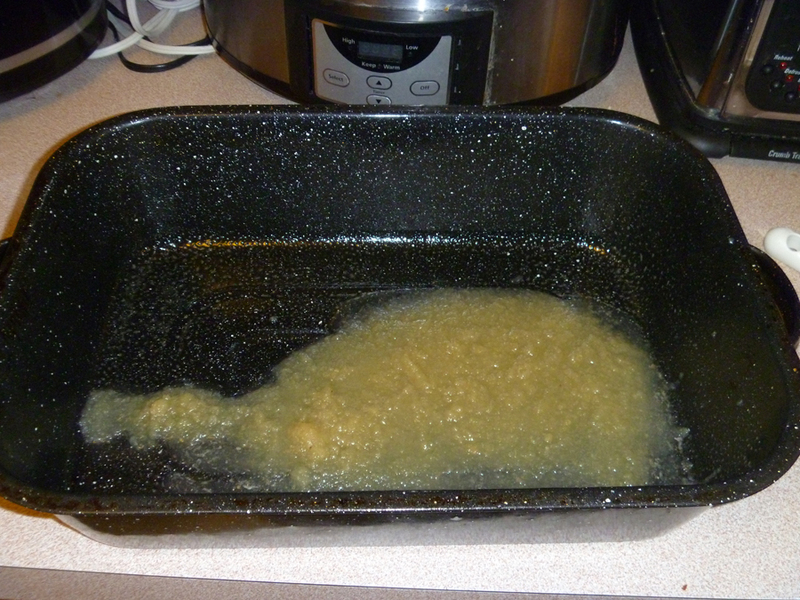 Layer the applesauce on the bottom of the pan. Don’t be skimpy. My photo here looks like I’m being frugal, but I wanted to demonstrate the process of spreading it throughout the whole pan. I may have a photographic fail here. Then put in the all the vegetables. I only chopped the onions, sweet peppers, and tomatoes. You can mince the garlic if you want, but you’re going to puree, so roasting them whole is fine. To save the threat of getting serrano juice in my eyes, I merely cut off the stems and put them in whole (we like our BBQ sauce with a bit of a kick, but roasting mellows out the kick, so don’t fear the serrano), save the tomatillos and celery. Stick them in the oven and roast until they begin to get crinkly. Then add the celery. 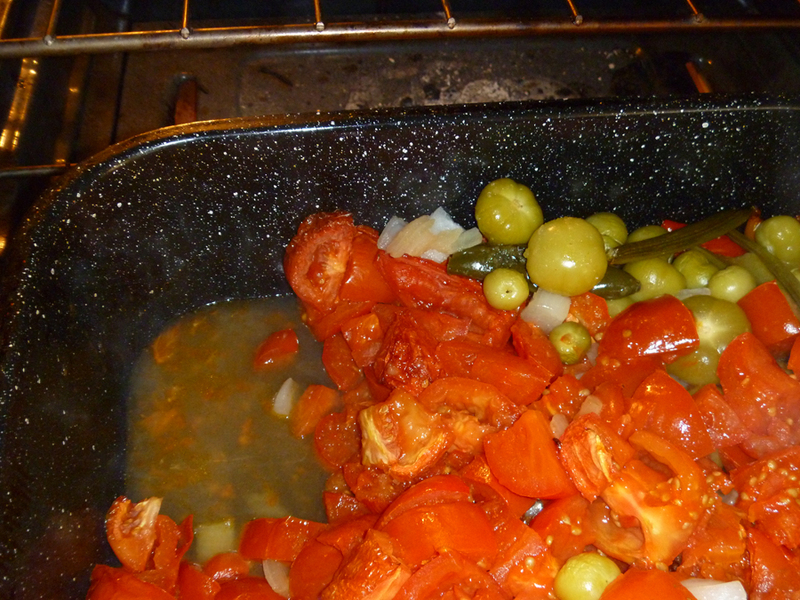 After the celery begins to show roasting color, add the tomatillos. We do this because the tomatillos and celery add even more moisture to the mixture and we want to roast it until the moisture is cooked down. Mine roasted slowly in the oven for about three hours. Before I started to see that the water was cooking off. If you open the oven door and see steam, you probably have moisture still. You can stir occasionally and see whether or not there is moisture. You can also push the veggies to the side to see how much moisture you still need to allow to roast off. When the moisture has all cooked off and you have all the veggies roasted to richness, take out of oven and let cool to room temperature. 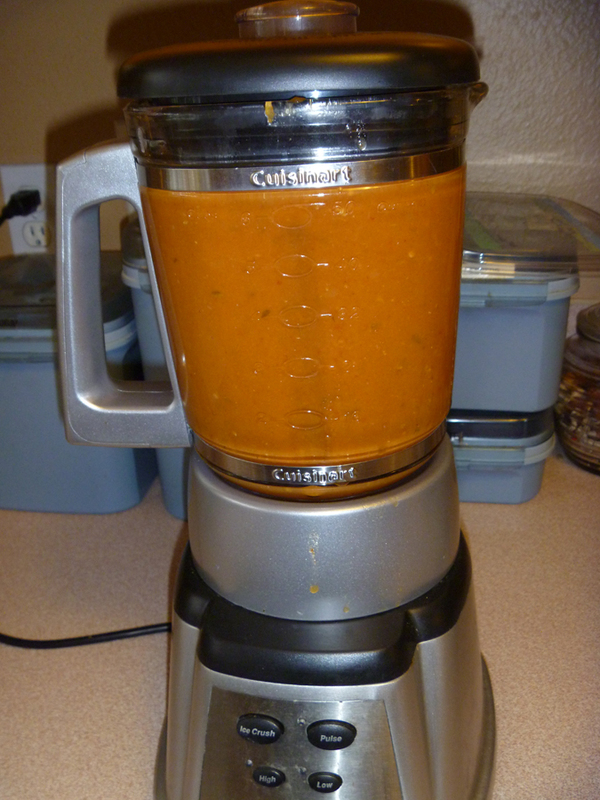 Then you are going to put the roasted veggies in a blender or food processors or food mill and blend until smooth. I used a blender because I have this itty-bitty tiny, only-good-for-one-batch-of-hummus food processor. I’d love to have a food mill…but I don’t just yet. I ended up with a few celery chunks in the end that I had to re-puree; so next time I’ll probably cut up the celery smaller. I also might have roasted just a tad longer to give it a little bit more of a smoky flavor. You could also accomplish this by broiling for a few moments if you’re a smoky-flavor lover, too. Get your canning jars, lids and water bath ready (you can find out how to do this elsewhere). I ended using 5 half pint and 2 whole pint jars. Then bring sauce to boiling, stirring occasionally. Fill the canning jars, wipe rims (very important), add lids and caps and process in hot water bath for 20 minutes (regardless of size). Let cool. I’ll let my sauce cure in the jar for about three months, but you could use immediately after seven days. This process should let you keep your sauce for a year shelf life; however, I don’t think it will last in my house that long. I’ve had in mind to try something like this for a long time. You’re the only one I’ve found on the internet who’s done it! 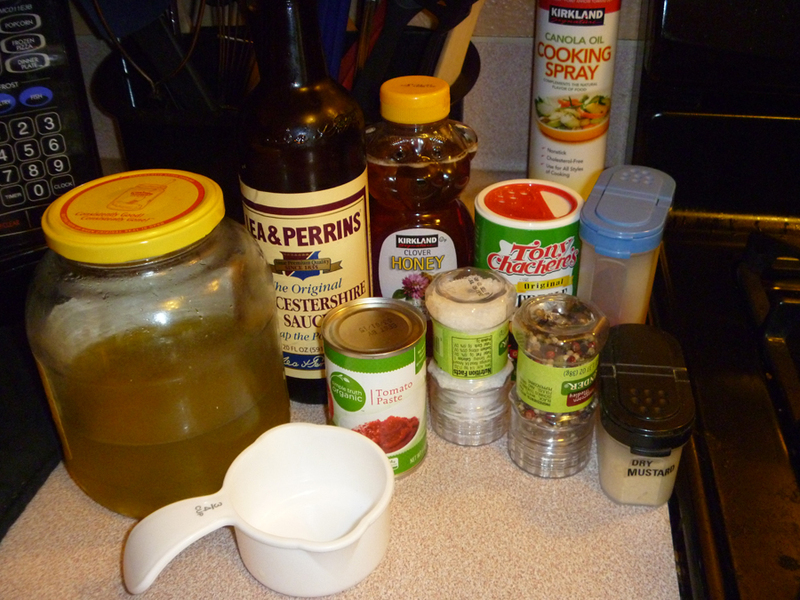 I notice tomato paste in the photo of ingredients. Did you also use that in your sauce? Jana, I guess I did. Good catch! I think it was only a table spoon or so. Let me go back through my notes and find out where I missed in my post here and get it corrected. Thanks! Jana — looked through the notes and sure enough found the spot for the tomato paste. The post has been edited! Thanks for the catch!